The cluster lies at an approximate distance of 980 light years from Earth. It has the designation NGC 6475 in the New General Catalogue. With a visual magnitude of 3.3 and an apparent diameter of 80 arc minutes – more than twice the apparent size of the full Moon – Ptolemy’s Cluster is an easy naked-eye target. 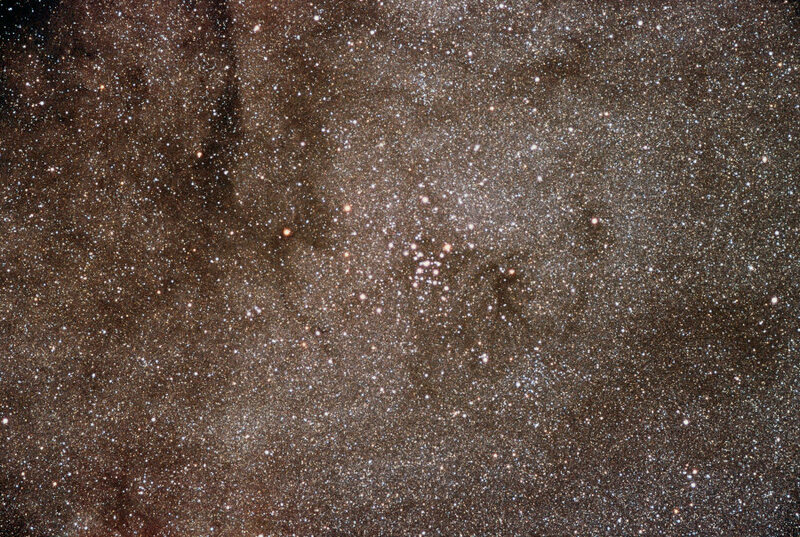 Messier 7 can be seen near the stinger of the celestial scorpion. The cluster is the southernmost Messier object in the sky, which makes it a challenging object for those in northern latitudes as Scorpius constellation never rises very high above the horizon. The best time of year to observe M7 is in the summer months. Because of its large size, the cluster is best seen in binoculars. Messier 7 can be found 4.75 degrees northeast of the star Lambda Scorpii, also known as Shaula. 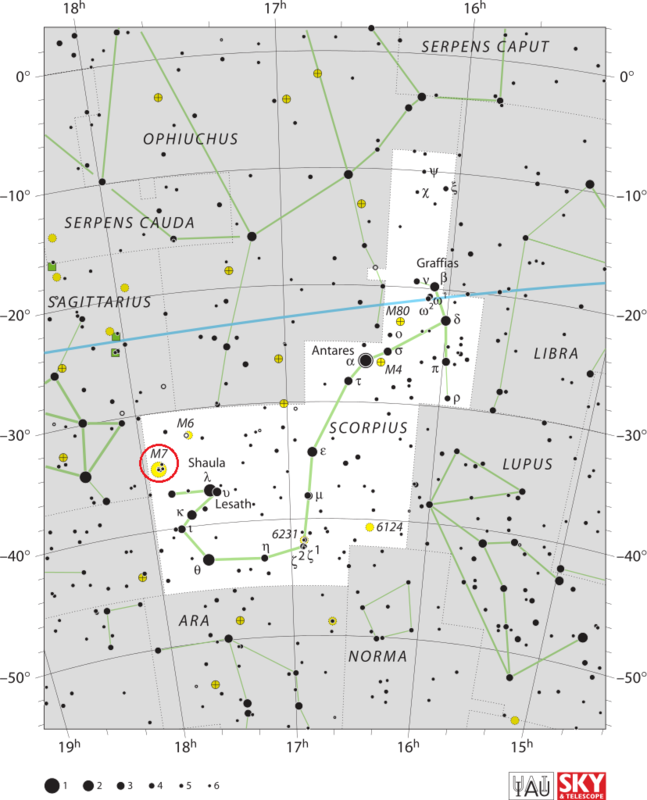 Shaula marks the scorpion’s stinger and is the second brightest star in Scorpius constellation, fainter only than the red supergiant Antares. 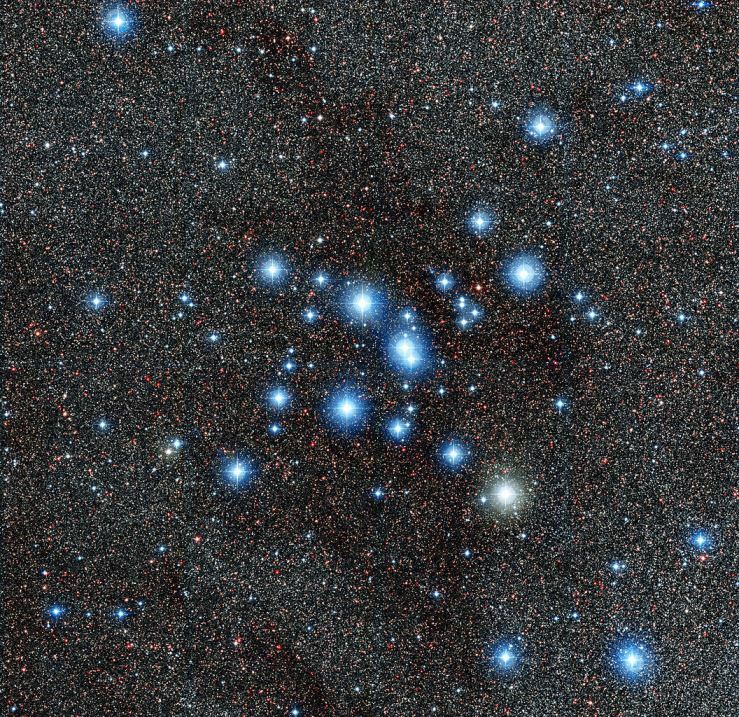 M7 is one of the most prominent open clusters in the sky, known since antiquity. It was named Ptolemy’s Cluster because it was first recorded by the Greek astronomer and mathematician Claudius Ptolemy in the 2nd century. Ptolemy listed the cluster in his Almagest as Object Number 567 and described it as a “nebula following the sting of Scorpius” in 130 AD. Italian astronomer Giovanni Batista Hodierna counted 30 stars in the cluster before 1654. In 1678, English astronomer Edmond Halley included the cluster in his catalogue of southern stars as No. 29. Open star cluster Messier 7 also called Ptolemy Cluster, photographed at La Palma, Roque de los Muchachos (Degollada de los Franceses). Ptolemy’s Cluster (Messier 7). Atlas Image mosaic courtesy of 2MASS/UMass/IPAC-Caltech/NASA/NSF. In the 19th century, M7 was accurately described as “coarsely scattered clusters of stars” by the English astrononer John Herschel. Messier 7 contains about 80 stars between magnitudes 6 and 10, all within an area 1.3 degrees across in apparent diameter, corresponding to a linear diameter of 25 light years. The tidal radius of M7 spans 40.1 light years (12.3 parsecs). The stars within this area can’t be pulled away from the cluster by the gravitational influence of the Milky Way. Messier 7 is believed to be about 220 million years old and has a mass about 735 times that of the Sun. It is approaching us at a speed of 14 km/s. The brightest star in M7 is a yellow G8-type giant with an apparent magnitude of 5.6. The stars in M7 were all formed at roughly the same time in the same large cosmic cloud. Groups of stars in open clusters, which are all approximately the same age and have similar chemical composition, are invaluable to scientists as they provide insight into stellar evolution and structure. The brightest members of the cluster – up to 10 percent of M7’s population – will eventually end their lives in violent supernova explosions, while the remaining fainter stars will gradually drift apart until they no longer form a cluster. Ptolemy’s Cluster lies only five degrees southeast of the Butterfly Cluster (Messier 6), which is about one-third as large and can also be seen without binoculars. Both clusters can be seen above the scorpion’s tail within the same binocular field of view.